Stephanie Lorek is an advocate for urban gardens and the outdoor learning movement. As an Educational Consultant at All Our Kin, she works with child care providers in their gardens and outdoor spaces. When people think of New Haven, “urban” is definitely a word that comes to mind, but maybe “agriculture” is not. Think again: you’ll find this city at the heart of where the two words converge. Many residents might be surprised to learn that this city has two urban farms, along with seven farmers’ markets, twenty school gardens, and over fifty community gardens. Now, thanks to All Our Kin’s Garden Project, we can add sixteen more urban gardens to that total: fifteen in the homes of our providers, and one outside the All Our Kin office. We’ve also built seven gardens in Bridgeport, another city in which the urban agriculture movement is taking hold. 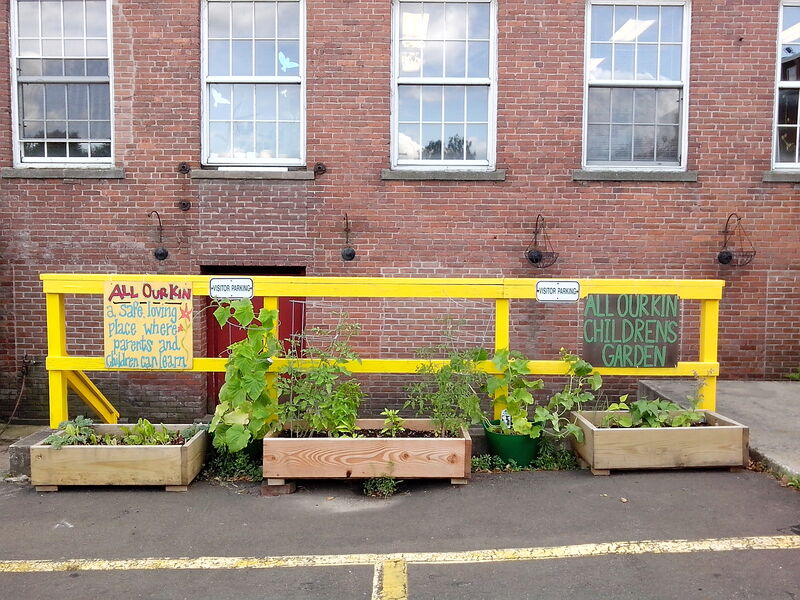 All Our Kin’s Garden Project is a recent initiative in which providers may apply to receive raised bed organic gardens to use in their child care programs. In addition to the raised beds, soil, plants, and tools, these providers receive regular visits from AOK staff to learn how to maintain the gardens and provide educational experiences for children. Through this project, we’ve found that children are spending more time outside, eating more fresh vegetables, and learning about their world (and important early math, science, and literacy concepts) through their work in the gardens. Our Garden Project providers are not only giving the children in their care important early experiences, but also empowering themselves, enriching their communities and adding to a growing number of green oases in the city. So, what is urban agriculture (or urban gardening)? It’s a growing movement that seeks to decentralize the food system by creating small, local food producing centers in urban areas. This can include everything from full-scale farms to yards, community gardens (shared gardening on public land), container gardening, rooftop gardening, or re-claiming under-utilized space like a vacant lot or a highway median to grow food. You don’t need a big space to have a big impact. Most of the gardens we’ve built for providers are less than 50 square feet: that’s three raised beds, each 4’x4’ in area. There are also many creative ways to grow vertically or by re-purposing existing materials. One provider’s garden is located on top of an asphalt driveway. Another is grown in three plastic tubs on a back porch. Our providers get creative, using everything from fish tanks to overhead cables to maximize growing space. Some have added composting, rain barrels, and yes, chickens, which can flourish in urban environments (even in cities as big as New York!). Urban gardens have benefits for individuals, communities, and the environment. Health Benefits: Urban gardens provide a source of fresh, local food for residents who otherwise may not have easy access to veggies. According to a 2009 report by the USDA, as many as 23.5 million Americans live in a “food desert”, more than a mile from a supermarket with limited access to a vehicle or public transit. Many people in these areas rely heavily on food from gas stations, convenience stores or fast food restaurants. 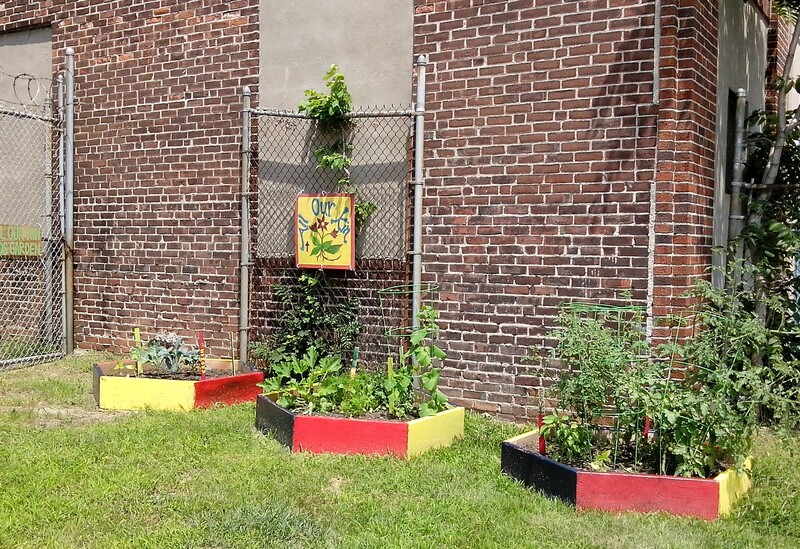 Community Benefits: Urban gardens beautify neighborhoods and they’ve been shown to reduce crime. Residents often experience more physical activity and emotional well-being, along with increased pride in their neighborhood. Urban gardens also can minimize the “heat island” effect of being surrounded by pavement and create green, shady leisure and recreational spaces where families and community members can gather. Environmental Benefits: Urban gardens attract crucial pollinators such as butterflies and bees whose habitats are disappearing. They minimize soil erosion, improve air quality, and reduce and filter stormwater runoff, which leads to cleaner watersheds. Most significantly, they cut down on the pollution associated with buying food that’s traveled thousands of miles to reach you and the chemical fertilizers used to grow it. When we involve young children in these urban gardens, we are likely to see these benefits multiply in the future as they become the caretakers of our cities and the stewards of our planet. In October we’ll graduate our group of fifteen “veteran” second-year New Haven gardeners, while our Bridgeport providers will prepare for year two. We hope to invite more providers to participate in the Garden Project in the 2015 growing season. Providers, be on the lookout for more information next spring. In addition, our Garden Project is only possible because of our amazing partners, Common Ground and GVI. Visit their websites to learn more about their wonderful work. For more information on urban gardening, check out these resources from Nature Works Everywhere. They’ve got lots of great how-to videos and tools to design and track your own garden. This entry was posted in family child care and tagged All Our Kin, Bridgeport, Education, environment, family child care, food, Garden Project, nature, New Haven, urban gardening. Bookmark the permalink. So glad to hear that you enjoy our posts!